Black springbok is a color phase variant of the common springbok, a small, graceful antelope with lyre-shaped antlers, which is one of the symbols of South Africa. Melanistic animals are not infrequently born into herds of free-ranging springbok, but for a real chance to harvest one, a hunter is advised to focus on game farms in South Africa and Namibia, who sometimes practice selective breeding to improve the probability of the occurrence of rare and desirable color phases. A black springbok trophy fee starts at about $500 in South Africa, and may go up to $1000 in Namibia. 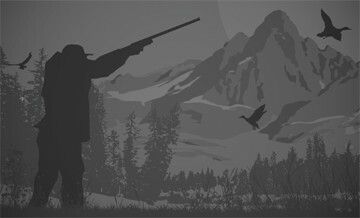 Add two of three days’ worth of daily rates, or from $500 to $1000, for the price of complete hunt. Some outfitters offer combination hunts for all color phase variants, including also white, copper, and common springbok. Such “springbok slams” are typically priced in the $5,000-$7,000 range. When to hunt Black Springbok? Springbok are the creatures of open plains, and spot-and-stalk is the method of choice for springbok hunting. The hunter and PH travel through the concession in search of a suitable trophy. Trophy estimation in case of a springbok may not be easy, as both sexes carry horns, and the springbok have an unusual in the mammal world case of sexual dimorphism, with females larger than males. Look for a smaller animals with horns that are bigger and thick at the bases. Fortunately, hunters are accompanied by a PH, whose job is to notice such details. Long shots are the rule in springbok hunting, and the target is small (a springbok seldom weighs more than 50 pounds), so it’s a good idea to select an accurate rifle for a cartridge with a flat trajectory. In the XIX century hunting was often the means to “clear the land” for cattle and farms. Today, the situation is totally opposite. Hunting concessions and game farms often use the land that formerly housed pastures and fields, rewilding it to the ecosystem that existed before European colonization. The process is financed totally by hunters’ dollars, so “hunting for conservation” is not just empty words. A hunter who pursues springbok to collect a slam of all color phases does not only engage in a challenging spot-and-stalk hunt, but also helps bring the legendary “trek-bokken” back into the picture. The Eastern Cape boasts 6 out of 7 vegetation biomes and is the most ecologically diverse of South Africa's provinces. This diversity in turn supports a large number of plains game species; from kudu in savannah bushveld, to klipspringer in the craggy mountain peaks and bushbuck in the coastal forests. The Eastern Cape offers an unrivalled variety of hunting opportunities. The area from Uitenhage to Steytlerville is acknowledged as having the highest density of kudu in the world. Every year, 25,000 kudu are hunted in the Eastern Cape. We enjoyed a 100% success rate for kudu in 2014, 2015, 2016 and 2017. During this period 24 out of 24 hunters who had a kudu on their wish list shot a trophy kudu, some chose to hunt a second one. You can select animals and number of hunters based on 1x1 guiding. Please contact for available dates.